Earlier this year, on April 15, 2015, I attended a lecture at the Florida Institute for Human and Machine Cognition (IHMC) in Ocala. The speaker was Jay Dean, Ph.D., director of the Hyperbaric Biomedical Research Laboratory and Professor in the Department of Molecular Pharmacology & Physiology, Morsani College of Medicine at the University of South Florida. Dr. Dean’s topic for the evening was “Your Body in Flight During World War II: How American Physiologists Learned to Protect the Health of Airmen in the World’s First High Altitude, High Speed Air War.” My interest in this topic was, of course, what this meant to my dad, George Edwin Farrar, a waist gunner on a B-17 crew who routinely flew missions over Germany from his base in Grafton Underwood, England. Anoxia is the absence of oxygen. The human condition resulting from the lack of oxygen in the blood stream is called hypoxia. High altitude flight in WWII would not have been possible without the creation of the oxygen mask as bombers in those days were not pressurized. WWII was the world’s first high-speed, high-altitude air war. As such, Dr. Dean noted that flying in unpressurized B-17’s, once the airmen were above 10,000 feet, the earth’s atmosphere could turn deadly. As altitude increased, barometric pressure decreased and oxygen levels dropped. Once an altitude of 10,000 feet was reached, the airmen would start using oxygen, except for on night missions, when they would start their oxygen while still on the ground as it improved their night vision. At sea level, blood saturation with oxygen is 95% and the airmen would experience normal actions and judgment. By 11,000 feet, oxygen in the blood is reduced to 85%, resulting in poor judgment without awareness, as if after a few drinks. At 13,000 feet, it is down to 80% and mental errors and possibly tremors or shakiness occurs. At 18,000 feet, blood saturation with oxygen is at 70%, resulting in a danger of collapse, or passing out. Anything above 20,000 feet would not support life for very long. A typical mission would be flown at altitudes of 20,000 to 35,000 feet or higher, requiring the use of oxygen by the air crew to survive. In addition to the lack of oxygen, the temperatures at these altitudes were extreme. 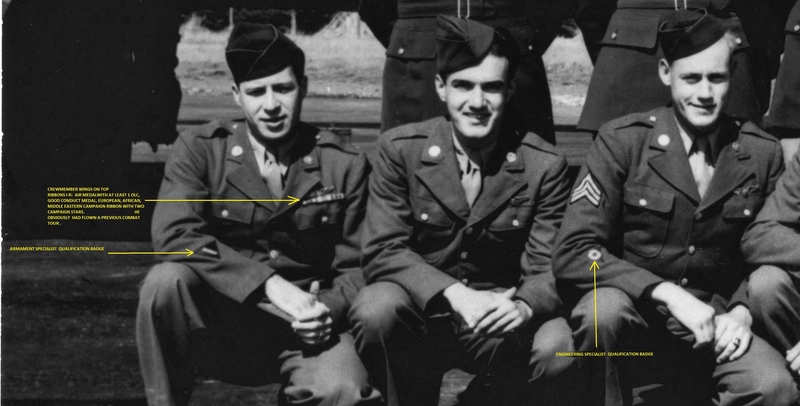 Dr. Dean explained that in the air war over Europe, at 23,450 feet, the temperature inside a B-17 would be around minus 13.5°F, in the warmer month of June. In January, it would only be around minus 36.4°F. Go up in altitude to 30,100 feet and the June temperature would drop to minus 39.5°F; in January, minus 60.9°F. In addition to the possibility of frostbite at those temperatures, ice buildup inside the oxygen masks was another consequence of the brutal cold. While trying to fly the ship, or man their guns, bomb sights, and other equipment, the air crew had to make sure they were getting enough oxygen and continually knock the built-up ice from their oxygen masks. 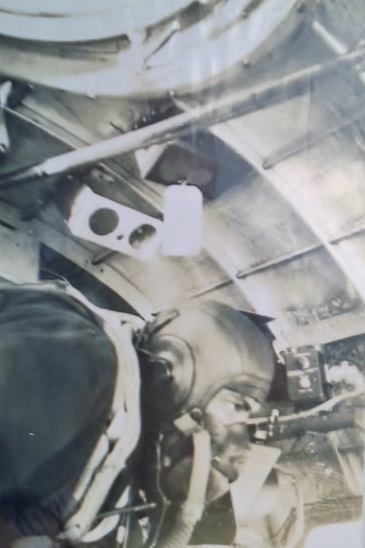 In this photo, Chester Rybarczyk, navigator of the John Oliver Buslee crew, 544th Bomb Squad, 384th Bomb Group of the 8th Air Force is shown wearing his oxygen mask on a mission over France. To view Dr. Dean’s entire lecture, click here. I will discuss the electric flight suits in a future post. After the war, Chester Rybarczyk returned to Toledo, Ohio where he and wife, Bernadette, raised four children. For a time, he drove a city bus. On July 16, 1952, he was accepted into the Toledo Fire Department and assigned badge #109. On March 9, 1964, Chester was promoted to Lieutenant. Chester’s son, Tony, remembers that his father was very proud of being on the fire department. He enjoyed the camaraderie with the other firefighters and he would often take his children to watch them train, or he would arrange demonstrations for their schools. At the end of his shift, he would come home and tell them stories about things that happened that day. On September 2, 1967, the Toledo Fire Department Rescue Squad responded to a two-alarm fire at a local north side tavern, Pee Wee’s Inn, at 5101 Suder Avenue. Lieutenant Chester Rybarczyk, now a fifteen-year veteran with the Toledo Fire Department, was one of the firefighters who entered the building to fight the fire. Suddenly, conditions inside the building changed and the rescue squad attempted to evacuate the structure. Four firefighters became trapped behind a partition separating the bar from a game room. Two of the four men made it out while Chester and another firefighter, James Martin, remained trapped. Crews on the outside used a ladder in a rescue attempt through a window. They were able to pull James out first, saving him. With James safe, they began to pull an unconscious Chester, overcome by smoke, out of the same window. The fireman that had a hold of Chester’s arm stepped on a power line that had fallen on the ladder. When the shock of electricity hit him, he lost his grip and Chester fell back into the burning room. Chester was finally removed from the building, but he died shortly afterward at Riverside Hospital. The other three managed to escape with only minor injuries. Chester’s son, Tony, was only eight years old when his father died. His mother, Bernadette, was able to tell him a bit about his father’s WWII experiences in the 384th Bombardment Group. She said that Chester did see his original crew, the John Oliver Buslee crew of the 544th bomb squadron, go down after a mid-air collision on September 28, 1944, but he didn’t talk much about it. Chester was the navigator on the Buslee crew, but was assigned to fly with a different crew that day. As a result, he was fortunate to not be involved in the mid-air collision. Instead, he was a witness to the fiery descent of the plane in which most of his Buslee crewmates were killed, unable to abandon the burning aircraft after it had broken into two pieces and spiraled toward the ground. A fellow Buslee crew member, bombardier James Davis, was also assigned to fly with a different crew that day. 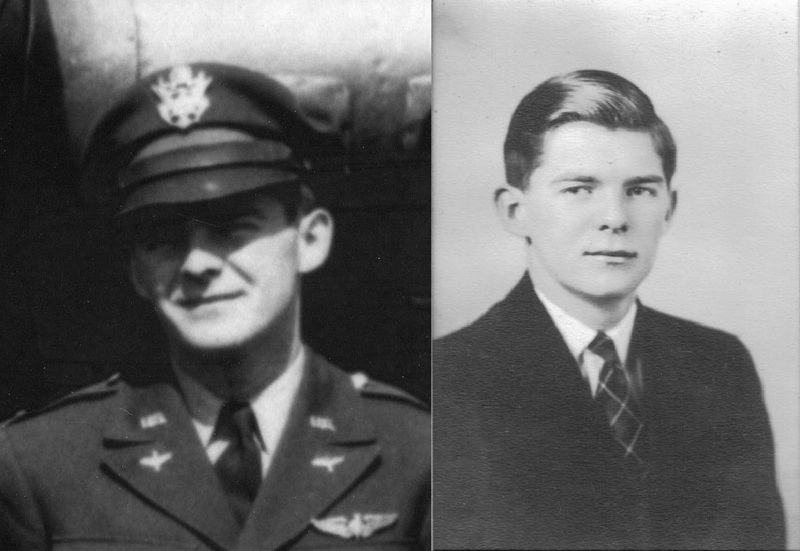 Chester and James served many of their remaining missions together. James finished his tour a few weeks before Chester in December 1944 and both returned home to the states. Chester and James remained friends after the war. After he got older, Tony was able to contact James, and James was able to tell Tony about his father, so that he could know him a little better. James died in 2009 in Indianapolis, Indiana. Chester Rybarczyk was born Jan 18, 1923 and died Sept 2, 1967 at the age of 44. He is buried at Calvary Cemetery in Toledo, Lucas County, Ohio, Grave: S 1/2, Lot 21, Section 34. Chester’s widow, Berandette, died in 1986 and is buried beside him. Thank you to Tony Rybarczyk, Chester’s son, for sharing this piece of his family history. On October 7, 1944 Chester Rybarczyk was on his fifteenth mission, 384th Bomber Group Mission Number 207 to a synthetic oil plant at Leipzig, Germany. At 1100 hours in the vicinity of Bad Iburg, Germany, Chester Rybarczyk’s aircraft was hit by flak and peeled off from formation with the #2 wing tank smoking and leaking. Rybarczyk was flying as Navigator with the James W. Orr crew on aircraft 43-38615, name unknown. They were last seen over Osnabruck with wheels down and under control. No chutes were seen to emerge. The aircraft landed in allied territory with all crew safe. A crash landing didn’t stop this crew for long. A week later Rybarczyk and the Orr crew were back in the air again on Mission 210 to the Marshalling Yards at Saarbrucken, Germany. 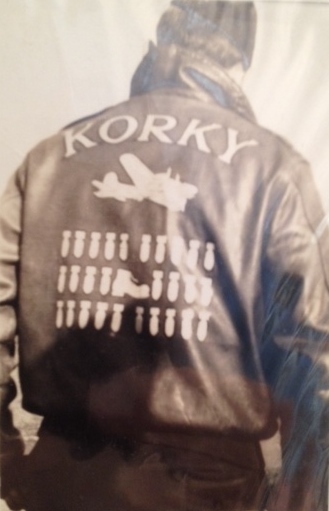 Rybarczyk’s flight jacket shows a picture of a bomb for each of his missions except for his 15th mission. That mission is depicted as a boot, signifying a mission from which the boys had to walk back after a crash landing. 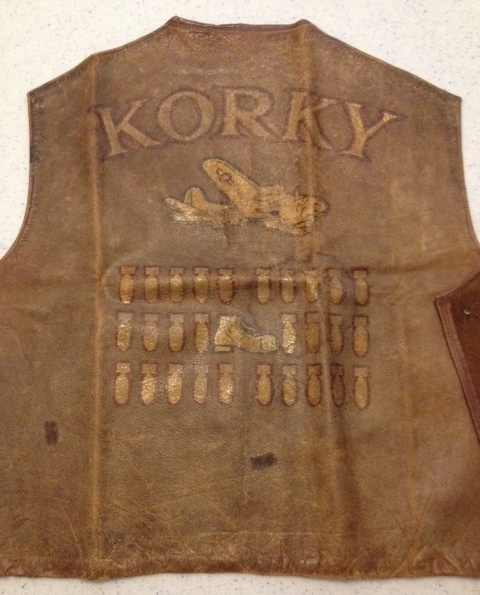 He also had the back of his jacket inscribed “Korky,” his nickname for his sweetheart back home, Bernadette Korlewski. His last duty was in December 1944, and Chester and Bernadette married on May 21, 1945. Information and photos provided by Tony Rybarczyk, Chester Rybarczyk’s son. According to the Sortie Report, on Mission 201 to Magdeburg on September 28, 1944, aircraft 42-39888, known as Hot Nuts, “Left formation after target for unknown reasons, but returned to base.” Flying on Hot Nuts was the William J. Blankenmeyer crew. Robert H. Obermeyer was the regular navigator for the Blankenmeyer crew, but for some reason, he did not fly on the September 28 mission. On September 28, Obermeyer was replaced as navigator by Chester A. Rybarczyk, who usually flew with the John Oliver Buslee crew. It was through this action that Rybarczyk was not on the Lead Banana with the Buslee crew that day, and instead of being a part of the mid-air collision with the Lazy Daisy, was a witness to it instead. 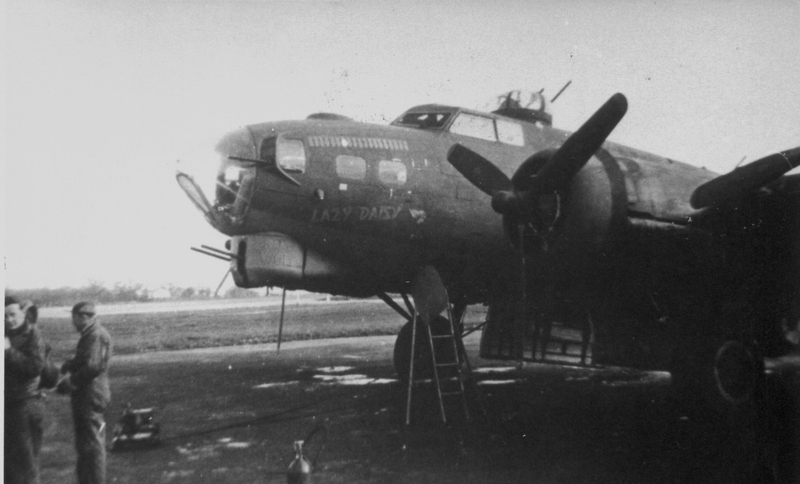 Undoubtedly, the crew aboard Hot Nuts left formation in an attempt to determine the fate of the crews of the Lead Banana and Lazy Daisy, especially the Buslee crew aboard Lead Banana, as Chester Rybarczyk was normally a part of that crew and could have been on that plane if he had not replaced Obermeyer on the Blankenmeyer crew. Chester Rybarczyk later wrote to George Edwin Farrar’s family, and probably to the families of the other boys in his crew, giving them hope that the boys survived the collision. Rybarczyk was limited in what information he could divulge, but what he did write contradicted official witness reports in MACR9753, Missing Air Crew Report 9753. I will publish Rybarczyk’s complete letter dated October 12, 1944 in a future post. September 28, 1944 – 384th BG Mission 201. 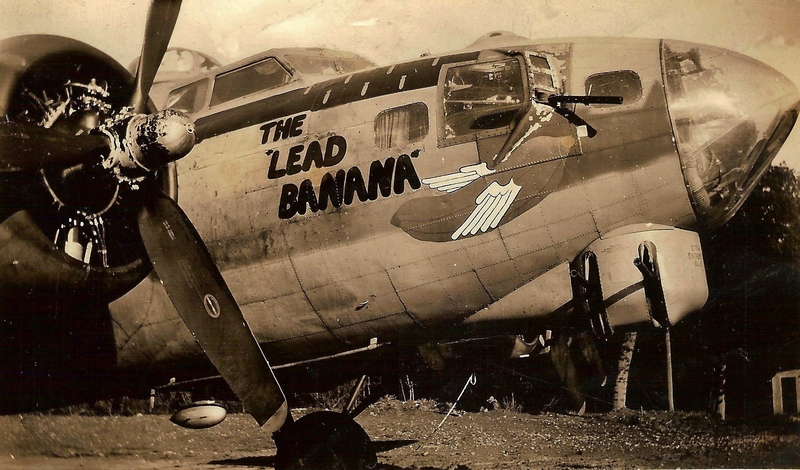 The Buslee crew flew this mission aboard aircraft 43-37822, Lead Banana. The Brodie crew was aboard 42-31222, Lazy Daisy. Chester A. Rybarczyk flew this mission with the William J. Blankenmeyer crew. William Alvin Henson II replaced Rybarczyk as Navigator on the Buslee crew. This was Henson’s third flight with the Buslee crew. James B. Davis flew this mission with the Raymond J. Gabel crew. Robert Sumner Stearns replaced Davis as Bombardier on the Buslee crew. This was Stearns second flight with the Buslee crew. George Francis McMann, Jr. flew this mission as Ball Turret Gunner on the Buslee crew. This was McMann’s first flight with the Buslee crew. Irving L. Miller, who had replaced Erwin V. Foster as Ball Turret Gunner five times on the Buslee crew, also flew with Davis on the Gabel crew this mission. Gerald Lee Andersen replaced Eugene D. Lucynski for the third time as Tail Gunner on the Buslee crew. Navigator – George Marshall Hawkins, Jr.
James Joseph Brodie (Pilot), Lloyd Oliver Vevle (Co-Pilot), George Marshall Hawkins, Jr. (Navigator), Robert Doyle Crumpton (Engineer/Top Turret Gunner), Gordon Eugene Hetu (Ball Turret Gunner), Wilfred Frank Miller (Tail Gunner), and Harry Allen Liniger (Waist Gunner) were all original Brodie crew members aboard the Lazy Daisy. The only non-original crew members were Byron Laverne Atkins (Bombardier/Togglier) and Donald William Dooley (Radio Operator/Gunner). Original Brodie crew Bombardier, William D. Barnes, Jr., last flew with the Brodie crew on September 13, 1944. Barnes did not fly again until October 17, 1944. He returned to flight as a Navigator, completed his tour after 35 missions, and returned to the US. Byron Laverne Atkins flew only six missions, three of them as a Ball Turret Gunner, and one as a Flexible Gunner. He served as Togglier for the Brodie crew on two occasions – once on September 21 and again on September 28, 1944. William Edson Taylor, the original Radio Operator/Gunner for the Brodie crew did not fly on the September 28 mission. On October 5, he flew as Radio Operator/Gunner with the Robert Bruce Birckhead crew. His aircraft was damaged by flak and crashed near Munchen-Gladbach, Germany (MACR 9754). Of the crew, four were killed, and five were taken prisoner of war, including Taylor. Donald William Dooley’s first mission would be his last. He flew as Radio Operator/Gunner for the Brodie crew on this mission. Two Bomb Runs – Primary Target Attacked: The 384th Bombardment Group (H) flew as the 41st CBW “C” Wing on today’s mission. Near the target, another formation of bombers flew below this wing, forcing them to hold their bombs. The wing made a second bomb run and released their bombs on the primary target. MIA; collided with 43-37822 over target; both ships went down on fire and out of control; no chutes observed; crashed near Erxleben, Germany; MACR 9366. MIA; collided with 42-31222 over target; both ships went down on fire and out of control; no chutes; crashed near Osteringersleben, Germany; MACR 9753. September 27, 1944 – 384th BG Mission 200. The 384th Bomb Group Mission 200 was also known as Eighth Air Force Mission 650. 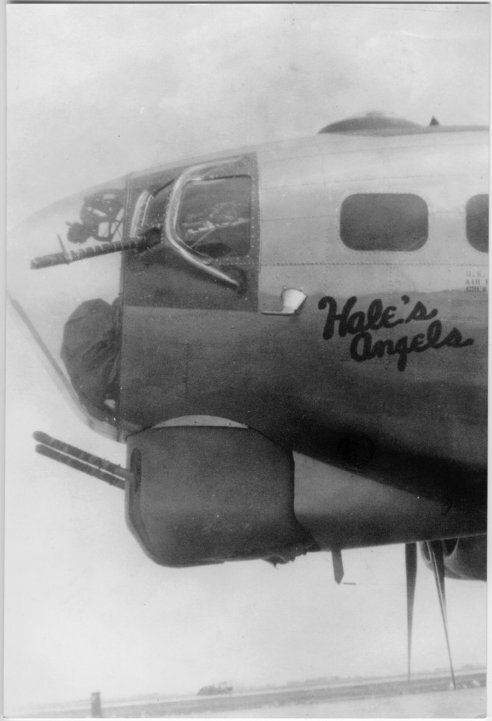 The Buslee crew flew this mission aboard aircraft 42-102449, Hale’s Angels. The primary target was the railroad marshaling yards in Cologne, Germany. On this mission, the Buslee crew was the High Group Deputy and Hot Camera Ship. Chester A. Rybarczyk did not fly this mission. William Alvin Henson II replaced him as Navigator on this flight. James B. Davis also did not fly this mission. Robert Sumner Stearns replaced him as Bombardier. Henson had flown with the Buslee crew once before, on September 3, 1944. This was the first flight with the Buslee crew for Stearns. Robert M. Mitchell replaced Erwin V. Foster as Ball Turret Gunner on this mission. This was the first time Mitchell flew with the Buslee crew, although he had flown with Farrar on September 19 as part of the William M. Reed crew. Gerald Lee Andersen replaced Eugene D. Lucynski for the second time as Tail Gunner. September 25, 1944 – 384th BG Mission 198. The 384th Bomb Group Mission 198 was also known as Eighth Air Force Mission 644. 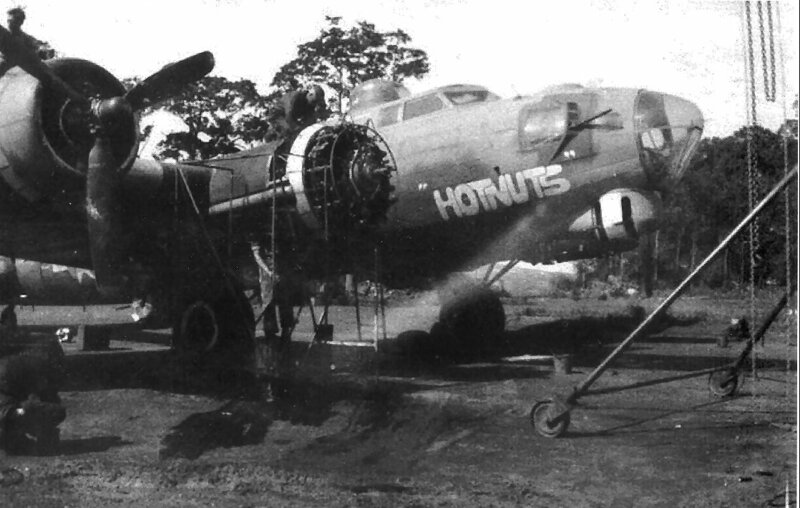 The Buslee crew flew this mission aboard aircraft 42-39888, Hot Nuts. The primary target was the railroad marshaling yards in Frankfurt-am-Main, Germany. Irving L. Miller replaced Erwin V. Foster as Ball Turret Gunner for the fifth time. This was the last time Miller would fly with the Buslee crew. On March 19, 1945, Miller completed his tour and returned to the US. Eugene D. Lucynski had bailed out of The Tremblin’ Gremlin on September 19 when it was struck by flak and had not returned to the Buslee crew. Gerald Lee Andersen replaced Lucynski on this and the next two missions as Tail Gunner. September 13, 1944 – 384th BG Mission 194. 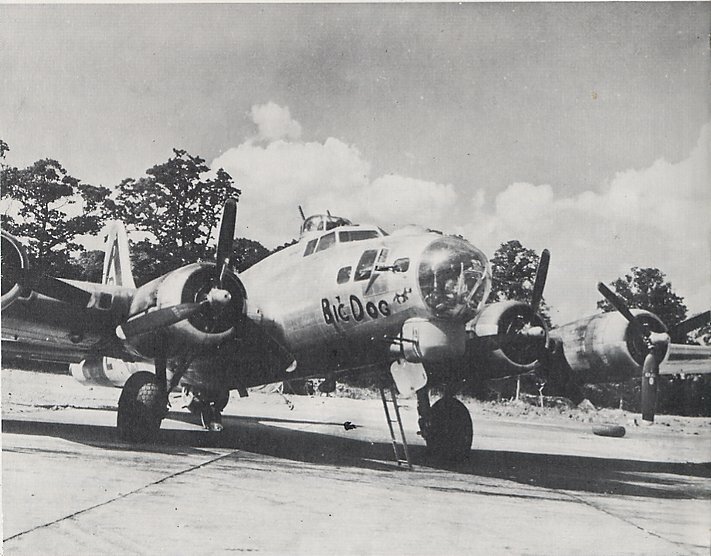 The 384th Bomb Group Mission 194 was also known as Eighth Air Force Mission 628. 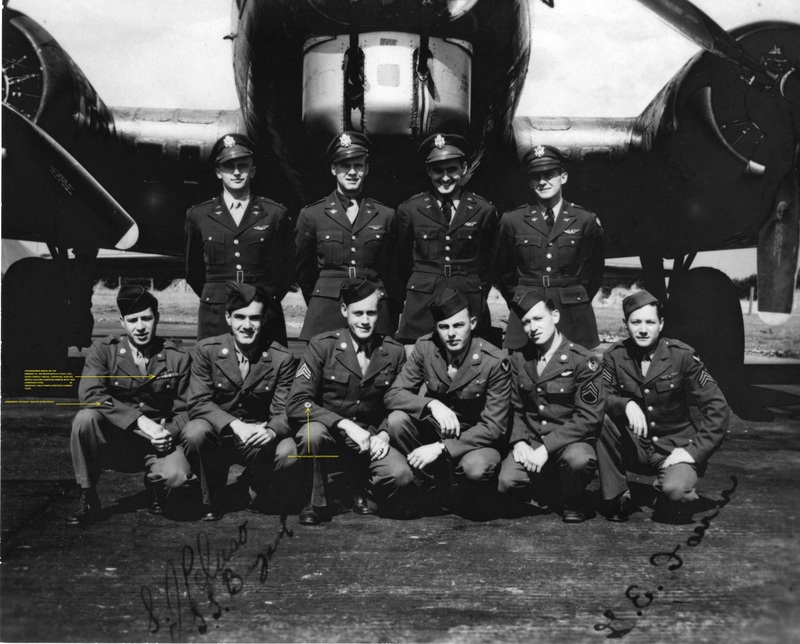 The Buslee crew flew this mission aboard aircraft 43-38016, Lorraine. The primary target was the oil industry in Merseburg, Germany. Commander – William A. Fairfield, Jr.
Not the normal Buslee crew at all. With William A. Fairfield, Jr. as Commander and John Oliver Buslee as Pilot, the regular Co-Pilot, David Franklin Albrecht, did not fly. Donald L. Ward replaced James B. Davis on this flight. Davis flew as part of the Joe Carnes crew. Albert K. Sherriff replaced Sebastiano Joseph Peluso. Irving L. Miller replaced Erwin V. Foster as Ball Turret Gunner as he had three times before. Lloyd E. La Chine replaced Eugene D. Lucynski as Tail Gunner. The only regular Buslee crew members on this flight were Buslee, Bryant, and Farrar. Rybarczyk, Peluso, Foster, and Lucynski did not fly this mission. September 11, 1944 – 384th BG Mission 192. The 384th Bomb Group Mission 192 was also known as Eighth Air Force Mission 623. The Buslee crew flew this mission aboard aircraft 42-102661, Big Dog. The primary target was the oil industry in Luetzkendorf, Germany. The same crew as mission 191 from the day before. Again the regular Buslee crew without Erwin V. Foster. Paul Leland Watson again replaced Foster as Ball Turret Gunner on this mission.